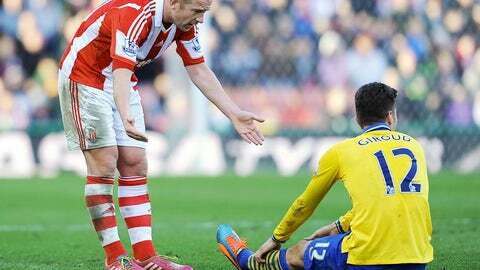 Stoke midfielder Charlie Adam tries to appease Arsenal striker Olivier Giroud. Stoke midfielder Charlie Adam has been suspended for three matches after being found guilty of violent conduct. The Scotland international was punished for his stamp on Arsenal striker Olivier Giroud during Saturday’s 1-0 win at the Britannia Stadium. Referee Mike Jones did not see the incident but it was picked up on television footage and although the Potters said they "vigorously appealed" the Football Association’s decision to punish the player, an independent panel upheld the charge against the 28-year-old. "Stoke City’s Charlie Adam will serve a three-match suspension with immediate effect after an FA charge for violent conduct was found proven," said an FA statement. "The incident with Arsenal’s Olivier Giroud, which was not seen by the match officials but caught on video, occurred during the fixture between the two sides at the Britannia Stadium on Saturday 1 March 2014. Stoke chief executive Tony Scholes was unhappy the club’s attempt to defend the player against the charge failed. "I am extremely disappointed for the effect that this is going to have on Charlie and on the football club," he told stokecityfc.com. The suspension means that Adam will be forced to sit out the forthcoming Barclays Premier League games against Norwich, West Ham and Aston Villa.